Social media includes the word “social,” and this well-known fact eludes many brands when they go about their social media strategies. Many brands and individuals use social media as a way to broadcast their message without responding and getting to know their audience—the very people brands are meant to serve. Many of the brands and individuals who don’t interact with other people don’t interact because interaction rarely leads to short-term results. Although interaction does not lead to short-term results, it does lead to long-term results. Some of the people I engaged with on Twitter continue engaging with me and my content to this day. Thousands of people have tweeted about my blog posts, and I interacted with many of those people. In fact, I still interact with some of them, and I have interacted with some of these people in the past 24 hours. Several of these people became my customers. The long-term result of meaningful interaction is a strengthened relationship in which a person likes you and trusts in what you do. Interacting with the people in your audience will allow you to amplify your message because more people will share it on their social networks. Most successful people don’t become successful on their own. They get help from other people. Interacting with your audience will allow you to find people who will help you become successful, meet new people who you can build relationships with, and give you and your audience a better experience on social media. 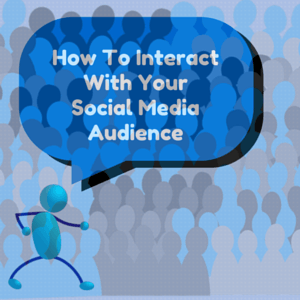 Now that you know the importance of interaction in a successful social media strategy, here are some of the methods you can use to interact with your social media audience. Each time one of my followers shares one of my blog posts, I thank that follower for sharing the article. Few people get thanked for sharing content on social media, and based on their response, my followers appreciate when I thank them. Thanking someone is an act of courtesy, but in this case, also an act of humility. I acknowledge that all of the individuals who visit this blog allow it to become successful. I can create the blog and write the content, but if no one visits my blog, then my message won’t spread. My audience makes it possible for my message to spread, and for that, I am deeply grateful. Realizing how important your audience is for your brand’s growth and current progress will allow you to develop a deeper appreciation for the people in your audience. Acquiring this deep appreciation for your audience will give you a good reason to thank someone in your audience each time that person does something as simple as sharing one of your articles. Regardless of whether you interact with your audience with your personal account or your brand’s account, your responses form a part of your reputation. If you always respond kindly on social media, then that will positively impact the reputation of you and your brand. However, the moment your responses become disrespectful and insulting, the reputation of you and your brand gets damaged. Building a reputation takes a long period of time, but that same reputation can be destroyed and taken down in a matter of minutes. Consistently showing kindness 100% of the time will allow your reputation of kindness to stay strong, and if your audience sees you as a kind individual, they will pay more attention to your brand. Not only is kindness important from a reputation standpoint, but kindness also encourages more conversations to take place. We like to interact with the people who are kind to us because they appreciate what we do. Moreover, it is easier to interact with a kind person and have a meaningful conversation than it is to interact with a rude individual and expect a meaningful conversation to build. Kindness allows you to strengthen your reputation, and if you have a strong enough reputation, the people in your audience will gravitate towards you and your message. Once you start interacting with someone on social media, you want that interact with that person for as long as possible. One of the most basic ways to continue an interaction on social media is by asking a relevant question that you know the person in your audience could easily answer. You don’t want to quiz your followers too often (i.e. asking when Twitter was created), but you should ask them opinion based questions (i.e. asking whether a follower uses Twitter more often than Facebook or vice-versa). Asking opinion based questions allows you to hear the opinions from the people within your audience, and some of these opinions can become inspiration for your next product or blog post. Once you get a response for your question, there are several ways to take the conversation further. You can ask another question, but in most conversations, excessively asking questions leads to an annoying encounter. You want the conversation to be a blend of your questions and insights. When in doubt of how to respond to someone’s social media post, think of an actual conversation in real-life. The person interacting with you on social media is someone behind a computer screen who knows the difference between an enjoyable conversation and a socially awkward encounter. How would you respond to that person in real-life to keep the conversation going? What is the best way to respond (on social media, you actually have time to think before you respond)? After asking yourself those two questions, type your response and send it. Then, wait for the other person to respond. When you first start out on social media, the conversations don’t readily come into your notifications tab. As you get more followers, your notifications tab will be filled with people interacting with you and trying to start a conversation. Regardless of whether you are a beginner or massively successful on social media, seeking relevant, meaningful conversations is a great way to interact with more people and grow your audience in the process. With over two billion tweets getting sent every week along with billions of other posts from different social networks, relevant, meaningful conversations occur all of the time. The only problem is trying to discover these conversations so you can interact with the people having the conversation. Using a social network’s search engine and looking for keywords within your niche is an easy way to find conversations that take place. If you use Twitter, then you can use the Twitter Advanced Search to find conversations taking place in your niche. In my opinion, the Twitter Advanced Search is the best social media search engine on the web. Once you find a relevant, meaningful conversation that you want to be a part of, become a part of that conversation. Leave your response. When you leave your first response, you don’t introduce yourself. You simply jump right into the conversation. Once you jump into the conversation, wait for the other people in the conversation to respond, and formulate your next responses based on the other people’s responses. Don’t stick around if you see a conversation going out of control. You won’t always get the opportunity to provide your insights in a conversation, but when you get the opportunity, include your insights. When you add value to the conversation, the people you interact with will be grateful for that additional value. Some people will be so grateful for the initial value that they will look for more value that you provide. These people will go to your blog and take a look at your product sales pages and possibly buy your products. One central belief many people share is that a product must be better than free value (i.e. blog posts and YouTube videos). If you over deliver in free value, then your product offers will be more attractive because the people in your audience will believe that the value in your products must be legendary. At that point, all you must do is live up to that promise. Interacting with your audience allows you to know the people within your audience. Too many people exclusively use social media to share content without interacting. These people want more traffic for their blog posts and social media posts that spread farther. Taking 5-10 minutes every day to interact with your audience allows you to build the long-term relationships that are necessary for consistently rising blog traffic and social media posts that spread farther. If you want to grow your social media audience, then it only makes sense to engage with the audience that you have already built. Do you interact with your followers? Do you believe interacting with your audience is worth the time? What tips do you have for getting more interactions and continuing conversations? Please share your thoughts and advice below.